Yet another Gerhard Richter exhibition sees the day, but the one at Beyeler Fondation in Basel is different. Celebrity curator Hans Ulrich Obrist brings to light the artistic schizophrenia of Germany’s most revered artist in a way that suggests that it may be the key to his success. 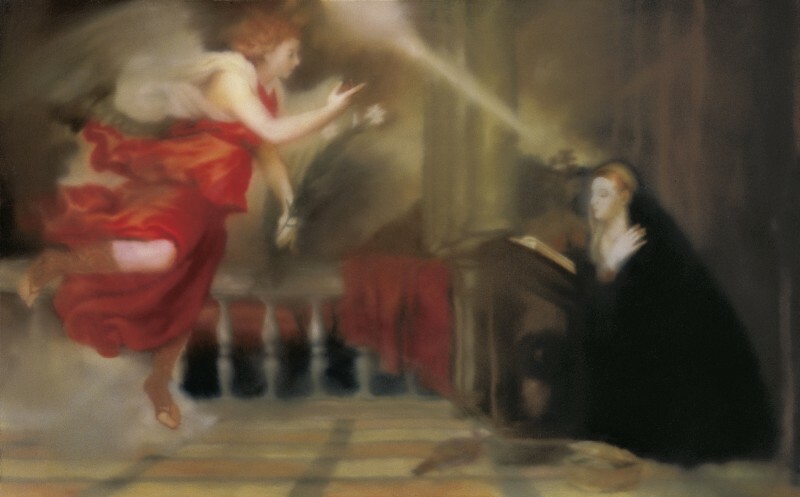 Verkündigung nach Tizian, 1973 (Annunciation after Titian) Oil on canvas, 125 cm x 200 cm, Hirshhorn Museum and Sculpture Garden, Smithsonian Institution, Washington, D.C. © 2014 Gerhard Richter In 1972 Richter entered into his phase of Vermalung, or 'Inpainting', in which figurative images were reworked, as if to make them disappear into the canvas. In 1973, he made five versions of The Annunciation after Titan, each one become gradually more obliterated into the background. They are shown together at Beyeler for the first time. Only a handful of contemporary artists command the world attention and delirious prices of the 82 year-old artist. Richter repeatedly breaks the record of auction prices for a living artist and clocks up the highest number of lifetime exhibitions. Trim and compact, with clear-framed glasses, Gerhard Richter sauntered into Beyeler with a look of cool detachment. He was about to face the press that descended onto Basel like a pack of hungry wolves. When Beyeler Director Sam Keller announced: “Gerhard Richter is the most influential artist of our time”, the artist remained politely aloof. When Keller added that no other contemporary artist needs another exhibition less, they both turned their heads to the curator. Hans Ulrich Obrist, who engaged in an on-going dialogue with Richter 27 years ago, when he was still a teenager, explained how he had convinced the artist to come to Basel by proposing to bring to the surface the themes that had not yet been explored. Branded the most important curator of his time, Obrist has kept, against all expectations, the contagious enthusiasm of a child and the long-limbed lankiness of an adolescent. He speaks four languages fluently and when he does, he rarely comes up for air. Hear podcast interview. He told Swissinfo.ch that curating is always a question of dialogue. After “long, long hours of discussion”, Richter and he settled on the idea of illustrating how cycles and series, as well as an awareness of spaces, traverse his work. 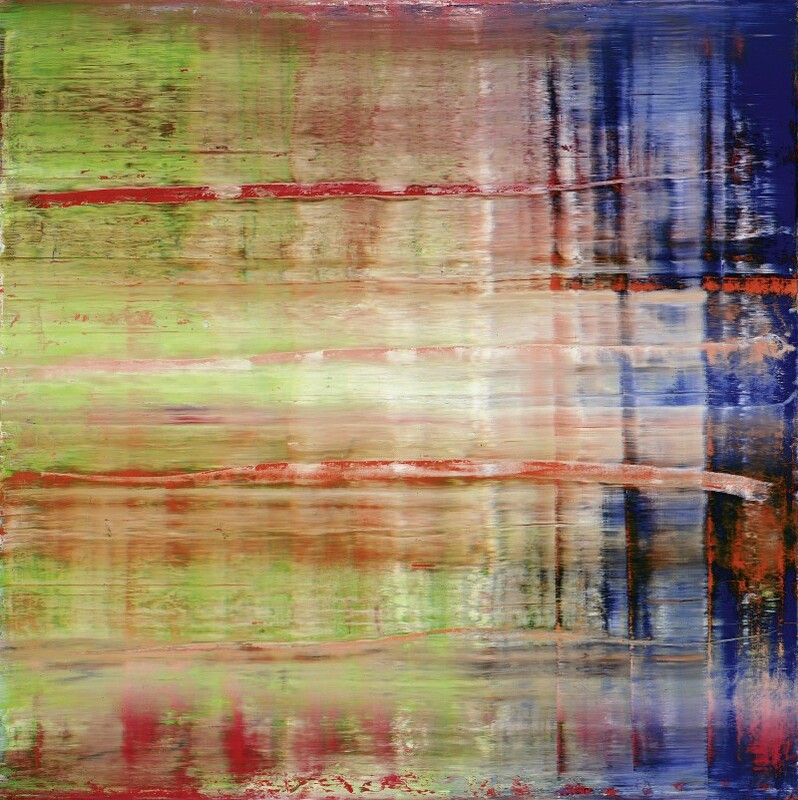 When an artist explores so many techniques and expressions, as Richter has over 50 years, he is bound to confuse. He may even appear inconsequential. Here, after all, is an artist who has built his reputation on photo-paintings, monochromes, blurred subjects and smeared paint, not exactly what one would consider great art. 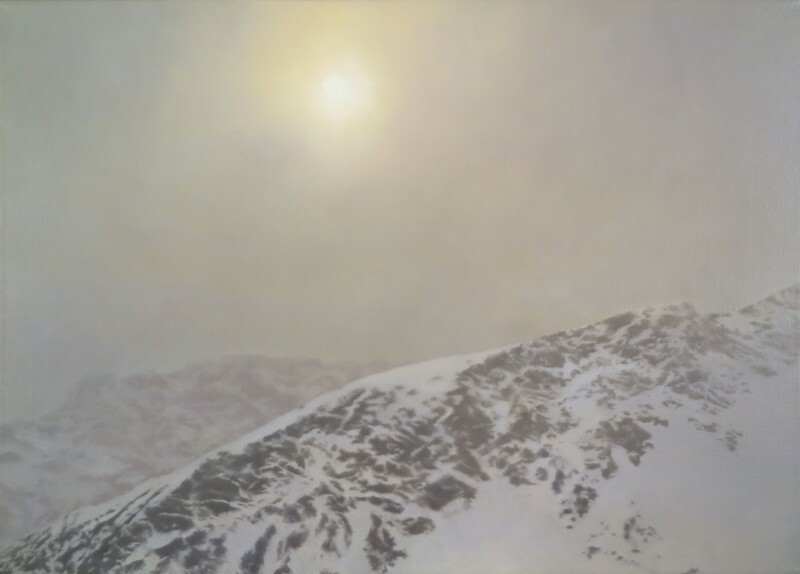 Davos, 1981 Oil on canvas, 70 cm x 100 cm, Stefan T. Edlis Collection © 2014 Gerhard Richter In 1981 and 1982, Richter followed up on a series of misty landscapes of mountains and icebergs already started in 1975 and reminiscent of the German Romanticist, Caspar David Friedrich, whom he admired. But the reconstruction of the series that have characterized Richter’s oeuvre and their presentation together, on the airy walls of the Renzo Piano building, several for the first time, make for a remarkable exhibition: the coherence between works that could very well have been made on different planets comes to light. Asked why he considered that it was the most beautiful show to date at Beyeler, Sam Keller told Swissinfo.ch: “The exhibition is touched by the hand of the artist. It is as much a work of art as anything that Richter has ever made”. It is not so much that the art fascinates (it doesn’t always), than the way it has been displayed. Each room tells a different story. Eight Student Nurses (1966) from Richter’s early photo-painting days, the year the horrific murders took place in Chicago, face the succession of dissolving figures in the Annunciation after Titian (1973): bleakness and hope together (see above). The 12 tall Wald (2005) on loan from MoMA (New York Museum of Modern art) create a cathedral-like feeling of religiousness. In 2005, Richter assembled 285 photographs taken in the autumn and winter months in a forest close to Cologne from which he made a book entitled Wald, as well as a series of 12 tall paintings to which this one belongs. He had by this time perfected the use of the glass and wood squeegee that he invented and that allows him to scrape through the different layers of superimposed paint. The Bach (1992) series, that belongs to Moderna Museet, Stockholm, delivers a sense of harmony and peaceful joy, whereas the 15 pictures from October 18, 1977 (1988) on the Baader-Meinhof gang, create the impression of walking into a morgue. Bach (2), 1992 Oil on canvas, 300 cm x 300 cm, Moderna Museet, Stockholm © 2014 Gerhard Richter Richter had already begun in 1972 to work with bright colours, but he waited 20 years to use them in an abstract manner, the way he does in this series of four large paintings inspired by the music of Bach. Composers are a recurring theme with Richter. The six large Cage (2006) paintings were inspired by the American composer, JohnCage, and the idea of using “counterpoints” in the Beyeler exhibition (see main article) came from listening to Arvo Pärt. The Estonian composer will be present at Beyeler in August. As for the main gallery, it defies gravity: the presence of a massive, but ethereal, glass sculpture entitled 12 Panes (Row) 2013 lifts the room. It is placed between six monumental Cage (2006) paintings that face the six red Abstract Painting, Rhombus (1998) made for a Renzo Piano chapel that was never built. It feels like the entire room is floating out into the garden. Richter’s preoccupation with the relationship of art to space could not be better illustrated. But the true magic touch throughout, the one that makes this exhibition stand out, are the small, figurative paintings of irresistible charm that break up the series and for which Richter is perhaps best known. Obrist calls them counterpoints, borrowing the term from music, which plays a large part in Richter’s inspiration. Ella, Richter’s daughter with Sabine Moritz, was born in 1996, the year the artist and his family moved into their newly built home in Hahnwald in the south of Cologne, part of which is Richter’s studio. This little portrait, made when Ella was ten, also belongs to the pantheon of Richter icons. The hallmark smudges and out-of-focus contours indicate a sense of urgency, as if Richter was attempting to dissolve time when allowing the figures to disappear. His latest foray into printed digital art (Strip, 2013) is on the same principal of dissolution, Obrist indicated, because the Pantone colours of the earlier 1024 Colors (1973) have been digitally stretched. 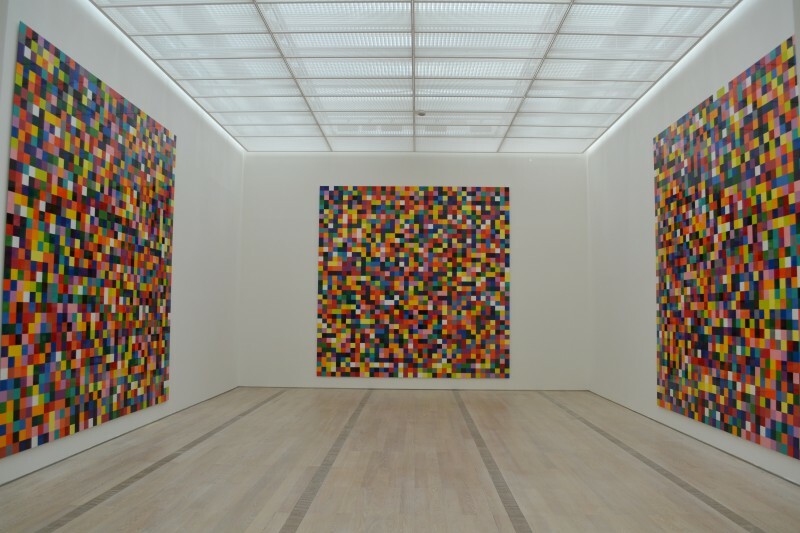 Along with the splendid 4900 Colors (2007) that fill en entire room, these works pose the question of the status of art when it is not fabricated by the artist at all. And yet, Richter does not have a Warhol-like factory and is only helped by two assistants and a studio manager, Obrist assures us. There are no longer criteria to judge masterpieces, he explained. The canons of the past, which allowed the quality of a work of art to be judged, as in the case of Mona Lisa, have disappeared. The point Richter makes may apply to his own work as well, because it would be difficult to identify any of the paintings in the show as masterpieces, other than the iconic figurative works by which he is defined, and adored, such as Betty (1988), Reader (1994) and Ella (2007). 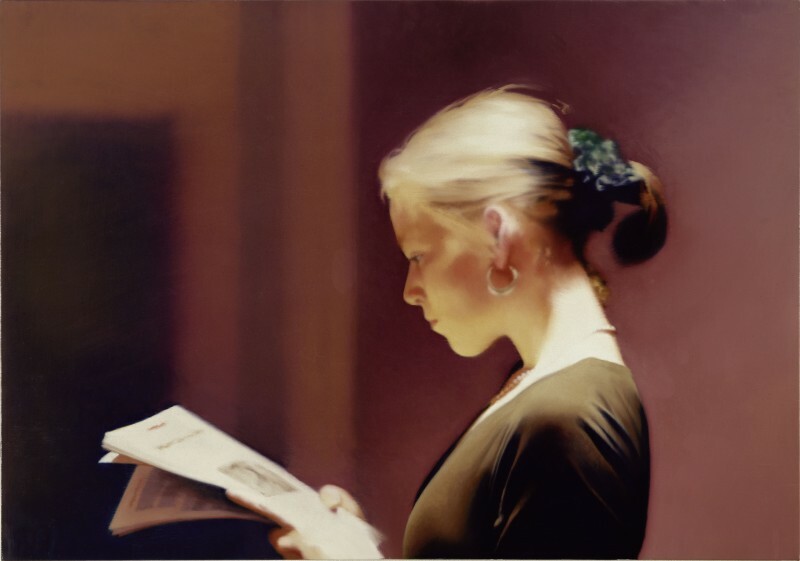 Richter made several photo-paintings immediately after meeting Sabine Moritz, who was to become his wife, that are revealing of his new found sense of tranquillity and happiness. Nor does there appear to be an underlying message, because even his Red Army period came 11 years after the gang terrorized Germany and was never followed up with any other political manifestations. Instead, his explorations, some would even say his schizophrenia, have ensured his place in the pantheon of art heroes. Perhaps that is what the new canons have become, the ability of an artist to be a mirror of his time, endlessly embracing the potential of new techniques. And remaining an enigma that vanishes into his own art. 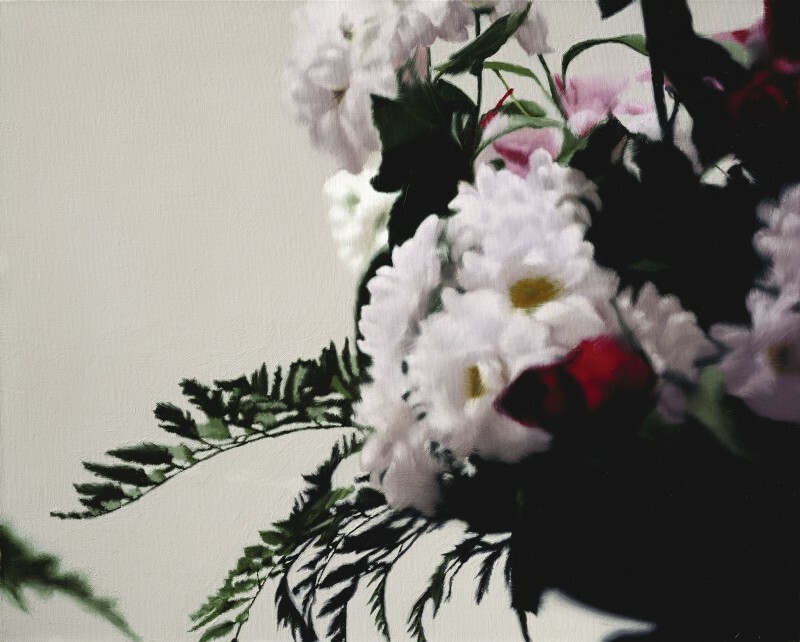 Blumen, 1992 (Flowers) Oil on canvas, 41 cm x 51 cm, Private collection © 2014 Gerhard Richter Richter says of his small photo paintings that they are a way of taking a rest from the large abstract paintings that require tremendous physical force. He was asked in Basel what he thought about the astronomical sums being spent on his paintings. Richter admitted that it pleased him and added, amused, that rich people die too: the paintings they buy may well end up in museums some day for everyone to see. In October 2012, a 1984 Gerhard Richter painting broke the record price for a living artist: Abstraktes Bild (809-4), part of Eric Clapton’s art collection, was sold for $34.2m (CHF30.5m). In May 2013, Richter broke his own record when a 1968 painting, Domplatz, Mailand, was sold at auction for $37m (CHF 33m). Jeff Koons, whose works went unsold at the same sale, has since broken a new record with Balloon Dog (Orange) sold for $58.4m (CHF 52m). A major Koons show also took place at Beyeler in 2012. Gerhart Richter was born in Dresden in 1932. He escaped East Germany when he was 29, after studying at the Dresden Academy of Fine Arts, where he learned mural painting. He moved to Dusseldorf in 1961 where the next year he formed a lifelong friendship with Sigmar Polke (1941-2010), also a former East German. He now lives in Cologne. In 1964, he started his photo-based paintings and had his first solo exhibition. Since then, according to the recently published Artindex 2014, Gerhard Richter has accumulated the largest number of lifetime exhibitions (1,256), ahead of Bruce Nauman (1,244) and Cindy Sherman (1,006). 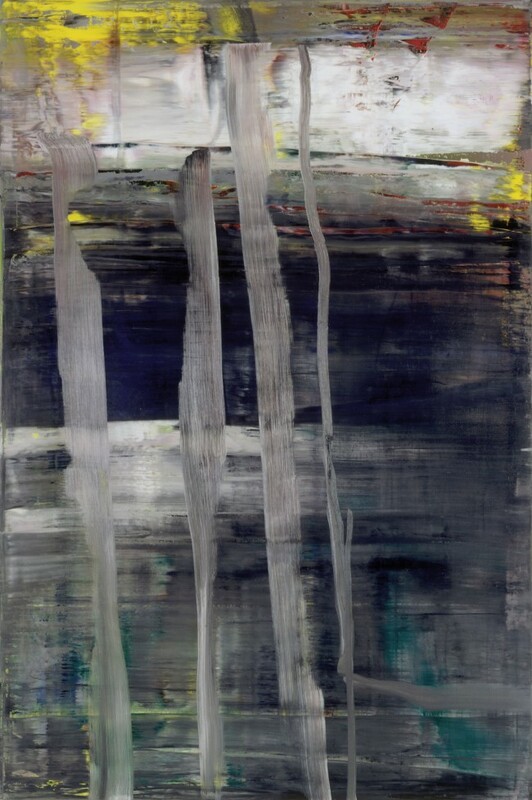 In 2011-12 a major retrospective entitled Gerhard Richter: Panorama travelled from Tate Modern in London to Neue Nationalgalerie in Berlin and then to Centre Pompidou in Paris. 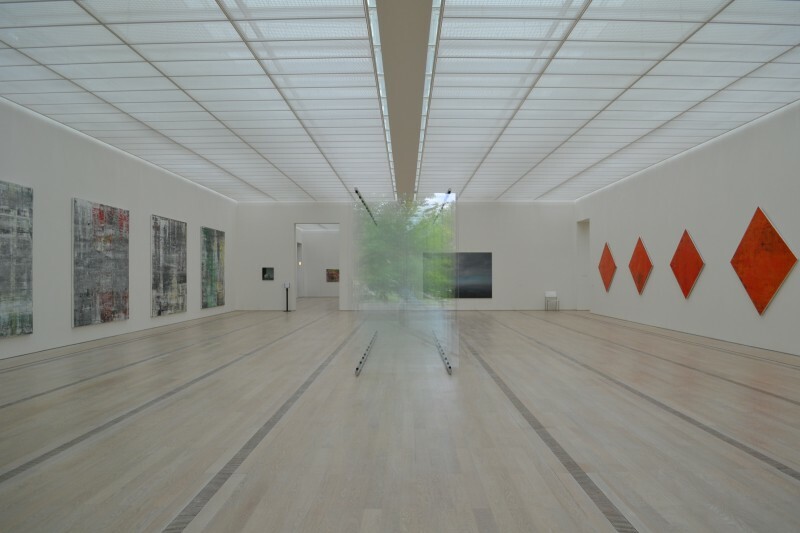 The Beyeler exhibition is said to be incomparably brighter. Born in Zurich in 1968, Hans-Ulrich Obrist is Co-Director, with Julia Peyton-Jones, of the Exhibitions and Programmes at the Serpentine Gallery in London. He has curated more than 250 exhibitions since organizing the first one in his kitchen in 1991 at the age of 23 when he was still a student in St Gall. Christian Boltanski and Peter Fischli & David Weiss were among the presented artists. Obrist is the author of The Interview Project, an extensive ongoing project of interviews. – curated an exhibition in Doha with the Israeli artist, Etel Adnan. – contributed to the Solaris Chronicles as part of the core LUMA group set up by Maya Hoffman for her foundation in Arles, which will soon be housed in a Gehry building. 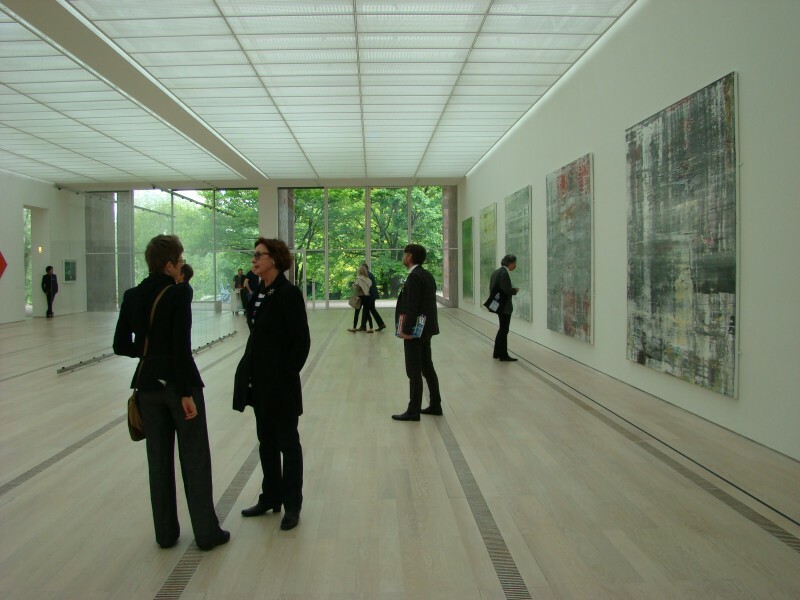 – curated the major Gerhard Richter retrospective for the Beyeler Fondation. – curated the Swiss Pavilion for the Venice Architecture Biennale (7 June-23 November). – curated 14 Rooms for Art Basel (14-20 June). In the meantime, Marina Abramovic’s new 512 Hours project will be launched at the Serpentine Gallery on 11 June, along with an Ed Aitkins exhibition, then on 26 June, the summer Serpentine pavilion by Smiljan Radic will be inaugurated.